Over the past five years, a legion of passionate community members have stepped forward to promote the Chippewa Valley's arts and entertainment scene, filling the pages of Volume One Magazine with articles, photographs and artwork confirming the region's cultural vibrancy. This book is about the individuals who have lent their time and talent to Volume One. 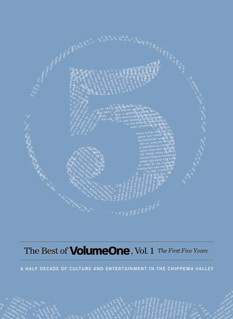 It's also a time capsule of sorts, documenting many of the people, events and experiences that have made Wisconsin's Chippewa Valley such a great place to live during the first five years of Volume One's existence. Like the magazine, The Best of Volume One, Vol. 1 proves that the Chippewa Valley allows its citizens the jaw-dropping opportunity to transform their ideas into something real, something significant and something people will embrace.